Popular with hunters and the U.S. military alike, .223 ammo is loved for its low cost and high efficiency. A small round fired at a high velocity can have surprising terminal effects, especially with modern bullet technology that lets our rounds produce even more energy than before. 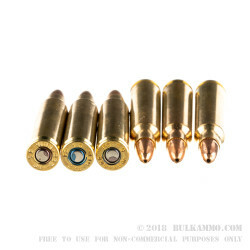 These 50 grain JHP rounds were designed with smaller game in mind. Their light weight allows them to zip out of the barrel at a blistering 3,240 feet per second with the same powder load as any other standard .223. These cartridges are ideal for hunting small, fast varmints, as they produce tight trajectories and groups at close range. 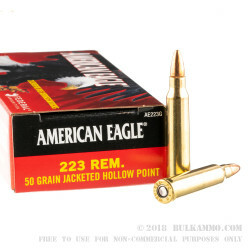 American Eagle's 50 grain JHP .223 rounds produce 1,282 foot pounds of muzzle energy, and their bullet exits the barrel at 3,240 feet per second. 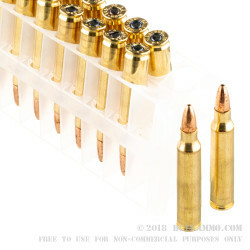 The cartridge is cased in boxer-primed brass, which is safely reusable. The rounds come packaged in 10 round plastic nose-down standoffs, two of which are contained in an American Eagle cardstock box. 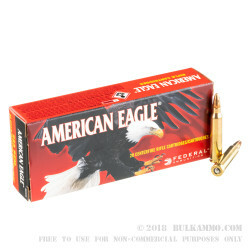 great ammo accurate and powerful..